Perkins Engines Company Ltd has honoured Jubaili Bros as Perkins first electric power self-service original equipment manufacturer (OEM). 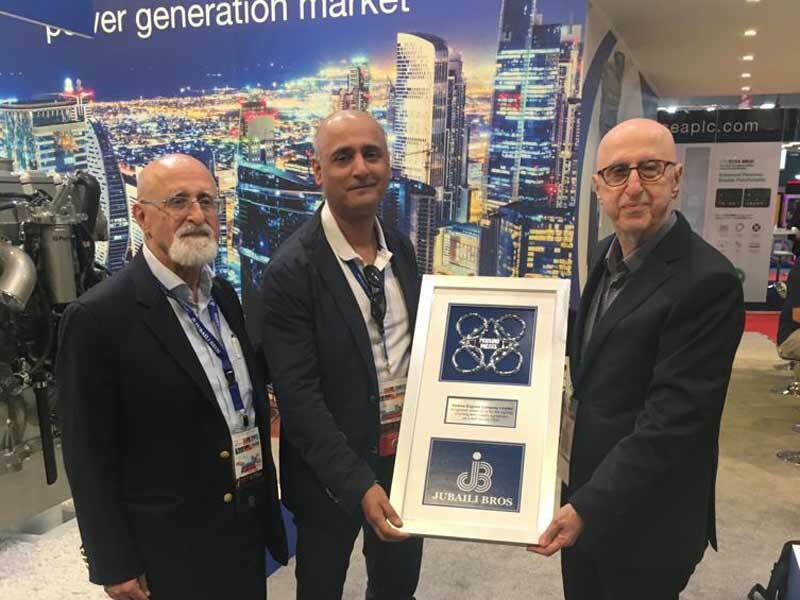 This recognition, given during Middle East Electricity 2019, will benefit Jubaili Bros customers is several ways. It ensures that JET and Marapco brand diesel generators are built with Original Perkins Engines, purchased directly from Perkins Engine Company Ltd. It entitles Jubaili Bros to offer direct Warranty coverage, which means its customers can rest assured that there’s a qualified professional nearby to serve. Jubaili Bros has over 40 years of experience and is a leading provider of Power Solutions in the Middle East, Africa and Asia. Jubaili Bros serves its customers by offering high quality diesel generator sets, assembled at 3 manufacturing plants with 29 branches and services centres deployed in 9 countries that are dedicated to customer satisfaction. Jubaili Bros offers JET (assembled in UAE) and MARAPCO (made in UK) brand diesel generators from 9KVA up to 2250KVA, powered by Perkins engines and coupled with Leroy-Somer alternators. Generator sets offered by Jubaili Bros carry one year manufacturer's warranty. With ready in stock of over 2,000 units of diesel generator sets, engines and alternators with spare parts, Jubaili Bros is there to serve everyone’s immediate needs. Being an ISO9001, ISO14001 and OHSAS18001 certified company and with overseas branches in Lebanon, UAE, Nigeria, Afghanistan, Kuwait, Ghana, Qatar, Uganda and South Africa, the company provides customers with service that is of international standards.